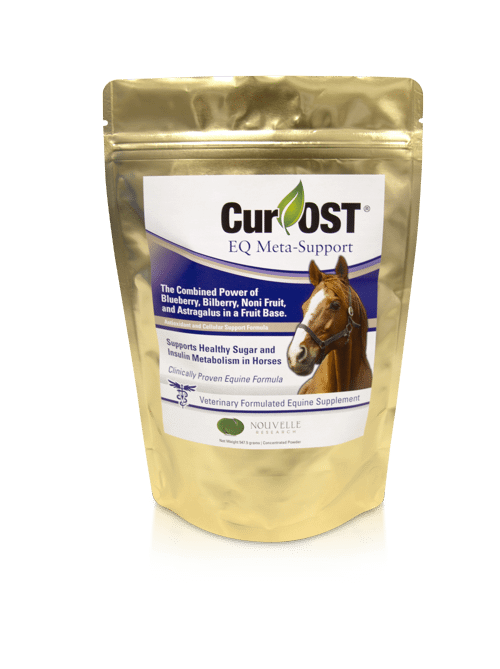 Cur-OST EQ Meta-Support uses the proven power of concentrated Blueberry, Bilberry, Noni Fruit, Amla, Poria, and Astragalus to Promote Healthy Sugar and Insulin Metabolism in Metabolic Challenged Horses. Research supported to promote a healthy body weight and condition through natural berry antioxidants and co-factors. Our most popular formula for easy keeper types with metabolic challenges! 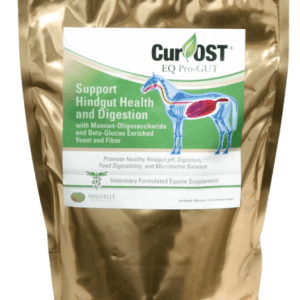 Cur-OST EQ Meta-Support uses the proven powers of concentrated Blueberry, Bilberry, Noni fruit, Apple Peel, Poria cocos, Astragalus and Amla to help promote healthy sugar metabolism and insulin function in metabolic challenged horse, while supporting a healthy inflammatory response and improved cellular function through natural antioxidant support. In many metabolic horse patients, inflammatory changes and oxidative cellular damage result in poor insulin function and contribute to rises in blood sugar levels. These changes then impair cellular function and sugar metabolism, resulting in negative changes throughout the body. In many cases, improper insulin function and sugar metabolism is associated with poor hoof conditioning, laminitis and overall foot soreness. It is also associated with Cushing’s syndrome (PPID) in some equine patients. Research has demonstrated the power of natural berries and fruits to promote healthy sugar metabolism and insulin function through natural balancing of the inflammatory response and provision of antioxidant support. The EQ Meta-Support formula is the only formula that combines concentrated berry and fruit extracts with digestive supporting herbs, Astragalus and Poria, to help benefit your horse on a cellular level. Benefits include supporting a healthy metabolism, insulin secretion and function, antioxidant support, promotes a healthy inflammation response, supports cardiovascular, eye and even nerve function. Clinical research data indicates that over 75% of horses in a research trial demonstrated improvement in energy and body condition in a 30- day period of time, when supplemented with the EQ Meta-Support formula, averaging a 33.8 lb weight loss. The EQ Meta-Support may be used alone or in combination with any of our other great Cur-OST formulas. How Does EQ Meta-Support Work? EQ Meta-Support helps to promote a healthy cellular response on many levels. The ingredients found in the EQ Meta-Support formula, are scientifically proven and research supported to help assist in normal sugar metabolism, insulin function, cellular health through antioxidant support and promote a healthy inflammatory response. Is EQ Meta-Support Effective for Metabolic Syndrome Patients? Can the EQ Meta-Support help my horse to lose weight? Yes, the EQ Meta-Support formula has been demonstrated to help promote a healthy weight through healthy sugar metabolism and insulin function. In one of our clinical based projects, patients utilizing the EQ Meta-Support formula lost an average of 45 lbs. in a 30 day period of time. Is the EQ Meta-Support okay to use with my horse’s other supplements? 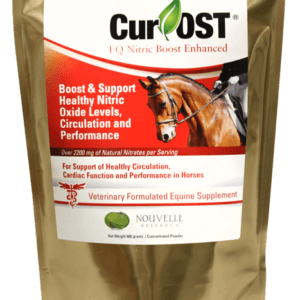 Yes, the EQ Meta-Support can be used with any of our other Cur-OST® formulas or any other supplement. How is the EQ Meta-Support formula used? The EQ Meta-Support formula is a powdered blend of berries and fruit extracts, with all natural flavoring. It is dosed at 1 scoop per 1000 lbs. once to twice daily, mixed with grain or other food medium. The taste is all natural, berry flavoring and generally well accepted by most horses. I noted a 65 lb weight loss in our horse, due to the EQ Metabolic herbs in combination with exercise and stress reduction. My horse is more fit, the picture of health and fat pockets continue to disappear, as does her cresty neck. Our veterinarian and farrier both commented that my horse was slimming down. She lost about 50# as part of the research trial. What is most noticeable is that her orbital fat pads have changed, not so puffy and more definition.